KAMPALA: The former deputy Chief Justice Steven Kavuma has told court that he is the rightful owner of the estate of his late guardian mother, Margaret Ddungu Nanozi comprised in block 265, plot 410 located in Kanaala Zone, in Mutundwe, Makindye Municipality, Bunamwaya Division in Wakiso District. The Land Division of the High Court summoned Justice Kavuma to respond to a lawsuit filed by six family members of the estate of Nanozi on April 12, 2018. The family claim to be the lawful administrators of the estate. The family members who want Justice Kavuma vacate the estate of the late Nanozi are Ronald Ssebirumbi, Badru Musaazi, Paul Walusimbi, Fulgensio Musaazi, Jalia Nabwami and Sophia Ssettimba. 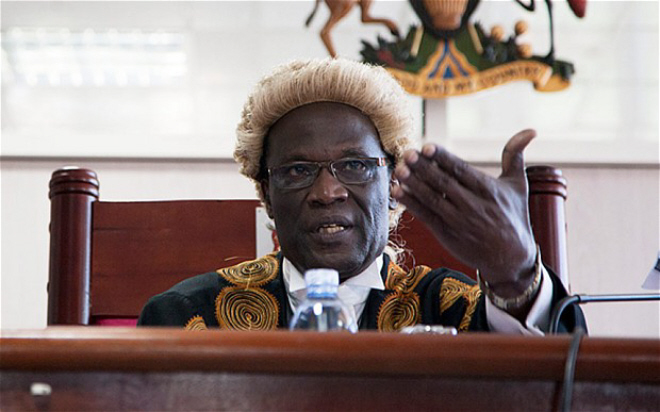 The petitioners in their law suit, want court to order Justice Kavuma to remove his security personnel that he illegally stationed at the late Nanozi’s residence and handover the vacant possession to them, saying they are the lawful administrators of her estate. In his summary notes , Justice Kavuma contends that he stayed with his late guardian mother from the age of three and that she voluntarily made a Will on December 5, 2011, in which she named Ms Erina Nabwami as her customary heir before passing on the contentious piece of land to him. The land in question measures 4.5 acres and comprises of a four bedroom house. To prove that he is the rightful administrator of the estate, Justice Kavuma named Ms Christine Makumbi and Margret Mukasa as witnesses to the fact that the late Nanozi was never forced into making the Will. In the summary notes, Justice Kavuma further contends that at the time of her demise on September 16, 2017, Nanozi was under his care at his home in Nsambya. The case is yet to be fixed for mediation hearing.